It was just another normal Friday in the elementary school where I work. Between sessions, the other therapists in my office and I were discussing our plans for the weekend and guessing which sorority the other had been in. An audible gasp rang out from one of the women in my office. Another shooting in a school. It's a sick world we live in where my first reaction was actually to roll my eyes (a fact I'm not proud of) and say out loud, "Ugh. Another one?" But, as she read the early reports from the news source and announced with sadness, "It was an elementary school" my annoyance (for lack of a better word) was replaced with soul shattering grief. The office emptied out, leaving me with my precious, Friday afternoon planning period, and I sat alone. Staring at my phone, afraid of what I would learn, I began to read what had happened in a school to children not unlike the ones I spend 5 days a week with. They are the same age. Some of them have the same names. They were looking forward to the same approaching holiday and Christmas break. They were learning the same basic concepts that would carry them through the lives they were supposed to live. Lives that are supposed to be full of joy and experiences and beauty and wonder. Lives that are - above all things - supposed to be very, very long. I desperately clung to reality and fought back sobs in an effort to get through the end of the day without breaking my "no crying in baseball" rule for work. I texted my husband who told me he had already gone and picked up The Incredible Hulk from daycare just to hug him and be with him in a way I so badly wanted to do. I tried very hard not to go into the black hole of sadness that I felt closing in on me and before I knew it, it was time to lead my last session of the day. I emerged from my office to see children running through the obstacle course set up in our common area with huge smiles on their faces. Smiles that reminded me that they would likely never understand what all of us adults were feeling at that moment. These smiles helped me make it through the day and I could hug each one of those kiddos right now for the gift they surely did not know they gave me on Friday afternoon. I hardly made it into my car when I was reduced to tears that did not end until late in the night. I sobbed when I watched our Commander in Chief fight the tears that I felt falling so freely. I sobbed again when they announced the names of the victims. I'm not sure I've ever felt this affected by a tragedy that truly had very little to do with me. But, that's just it. After you become a parent, any crime against any child becomes a very personal thing. I allowed TIH to eat froyo last night. I allowed him to sleep in between us even though he used my ribs as his own personal foot rest/kicking target. We went to the mall and took horrendously overpriced carousel rides and let him have french fries at lunch and took photos with Santa and found ourselves to feeling just as excited as a kid should feel at this time of year. In short, we allowed the hope to creep back in - the hope that there was still joy to be had. 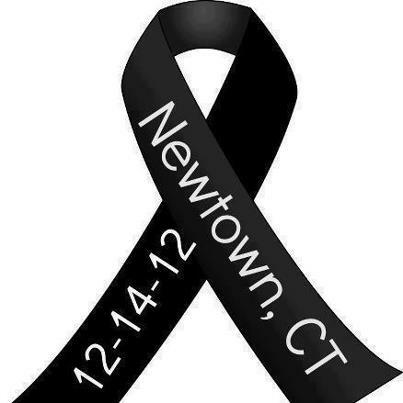 My heart and soul goes out to the families of this tragedy. To the children who have survived through terror that will grip them for the rest of their lives. To the children who did not survive. To the parents who were told their little ones were lost. To the teachers and administrators who selflessly laid their lives on the line to protect the children they have served daily. To the community that is currently living in the "after." I wrap you in my arms and pray every prayer that I know for your peace and comfort in the face of this ugliness. That you may one day begin to hope again. What a beatuiful post. You have such a way with words. I've given you the Liebster Award! Check out my blog for the details!